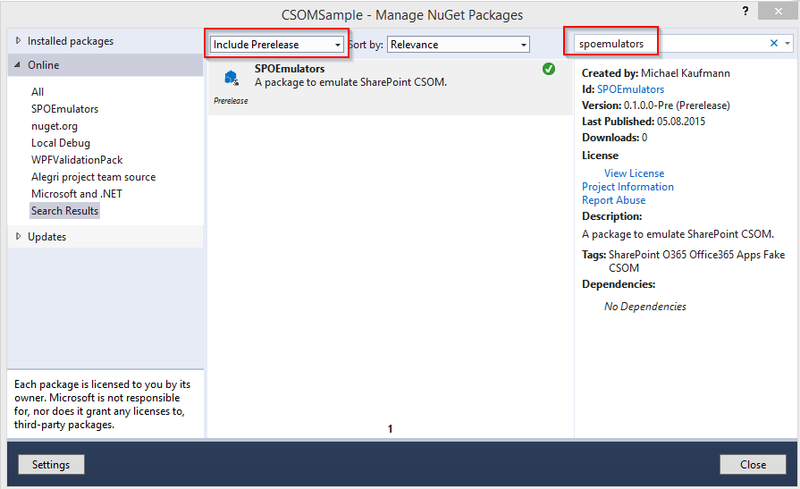 Today I published the first beta of SPOEmulators on NuGet.org. The project is open source (MIT license) and is available on GitHub. SPOEmulators is a framework that helps you to write unit and integration tests against Office 365 or SharePoint on premise using the client side object model (CSOM). It uses the Microsoft Fakes Framework to emulate the SharePoint or O365 CSOM. The benefit is, that you an write your tests against the real backend as integration tests. If your code works you can add a little more effort to convert the test to an isolated unit test. Like this it executes much faster and you do not have to wrestle with passwords in your app.config file. To ensure that the code still works you can add a separate config file on your test machine an execute the same test as an integration test. If you want to install it with the Gui, make sure to “Include Prereleases”. The package depends on the Microsoft Fakes Framework. This was only available in Visual Studio 2012 in the Ultimate Edition until Update 3. In later Versions it is available in the Premium and Enterprise edition. You begin by creating a SPOEmulationContext. There are three options for the isolation level parameter. Fake All calls to the SharePoint CSOM are isolated. You do not need to provide any further parameters in this mode. A ShimsContext is also created for you. Integration All calls are executed against the real SharePoint server. You need to specify minimum a URL if you are on premise. For O365 you also need to pass in the user name and passwort using the ConnectionInformation object. The SPOEmulationContext creates a seperate ClientContext that can be used to clean up or prepare the target site in your tests. It also creates a ShimsContext. None The same like integration but with absolute nothing enabled. No ShimsContext and no ClientContext are created. You can find a sample project in the source code. The sample also provide sample config files for integration and unit testing. I will provide you soon with more samples and features. Please let me know what you think and what features would be the most important for you. Please remember that it is still a beta. Only a very small part of the CSOM API is tested. Pingback: SPOEmulators beta available | Dinesh Ram Kali.